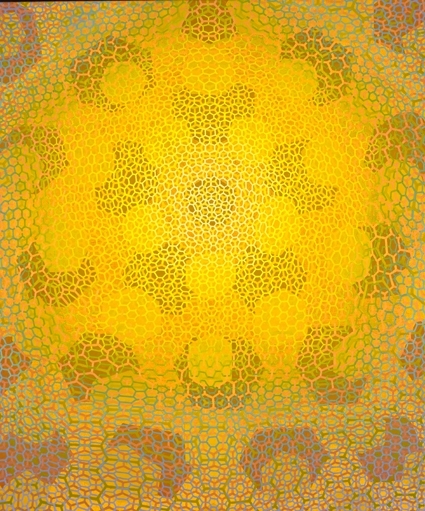 In the Net Series a pattern of scaled and nesting hexagons forms a foundation for the exploration of color interactions. Color gradients are selected to enhance spatial effects and to produce the impression of inherent light. The paintings synthesize the color theory of Joseph Albers, the precepts of perceptual painting (Op art), and the structure of fractal patterning. Bruce Pollock has exhibited his abstract paintings and drawings in numerous solo exhibitions in New York City, Philadelphia, Chicago, Santa Monica Museum of Art, The Shenzhen Art Museum, Shenzhen, China, Vancouver, BC and other locations. MFA in Painting from the Tyler School of Art, BFA from the Cleveland Institute of Art lives in Philadelphia and teaches painting at Drexel University.